Access control systems prevent unauthorised entry to your premises. They give you the assurance of controlling who is on site at any time. Dragon Security Systems will make sure that your access control system will integrate seamlessly into your day-to-day operations. Since 1989, we have applied our vast experience of installing and maintaining bespoke access control in Cambridgeshire, Norfolk, Suffolk and across East Anglia. 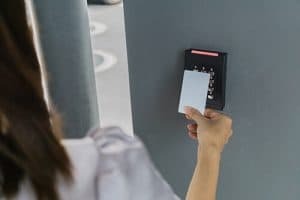 Our range of access control solutions includes swipe card, pin code locks, video door entry and biometrics-based units for fingerprint and retina verification. 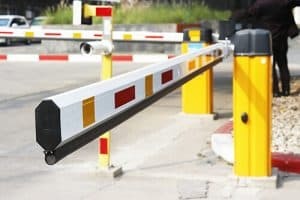 Our flexible services allow you to set up multiple profiles for each staff member, and our easy-to-use systems can be connected to gate and barrier control devices, allowing you to streamline your security. Our dedicated after-sales maintenance service will ensure that your access control systems are kept in perfect working order, long after the manufacturer’s warranty has expired. You can be assured that we spend a great deal of time selecting quality components that we know will provide our customers with years of trouble-free service. Set up unique profiles for each of your staff members and limit their access to certain parts of the building or during certain hours. Control and monitor who goes in and out of your property with high-tech access control systems for vehicles. Install an access control system that works on the basis of entry and ID cards for every person. Dragon Security Systems offers a cost effective way to supply entry cards. For the domestic market, since 1989, we have been installing and maintaining bespoke video door entry systems. At Dragon Security Systems, we recognise that every home’s security needs are unique, so choosing a system that is right for you will depend on the size of your home and the number of people that will need access. The main advantage of a door entry system is that you have total control of who enters your property and when, meaning that you can better protect your visitors and property. With our advanced systems you can secure specific areas of your home, or you can integrate your system with other security systems to allow for centralised property management.